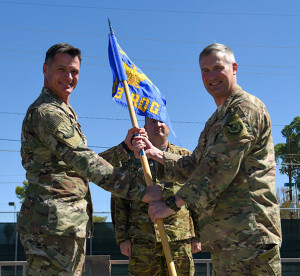 Col. Michael Drowley, 355th Fighter Wing commander, presents Col. Jason Pifer, 563rd Rescue Group commander, with a guidon at Davis-Monthan Air Force Base, Ariz., Oct. 5, 2018. The guidon was presented to Pifer in commemoration of the 563rd RQG’s realignment from the 23rd Wing to the 355th FW. The 563rd Rescue Group, a geographically-separated unit out of Moody Air Force Base, Ga., was realigned from the 23rd Wing to Davis-Monthan AFB’s 355th Fighter Wing Oct. 1, 2018. 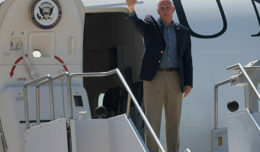 The realignment brought all rescue squadrons and maintenance units that fall under the 563rd RQG, to include other geographically-separated assets located at Nellis AFB, Nevada, under the supervision of the 355th FW. Thanks to this consolidation, the Air Force now has two installations with mirroring and equal capabilities. Both bases are now home to HC-130, HH-60 Pave Hawk and pararescue squadrons that provide combat search and rescue support and A-10 Thunderbolt II fighter squadrons that provide close air support. “This increase provides a strategic advantage for CSAR operations in the future.” said Col. Jason Pifer, 563rd Rescue Group commander. Since its activation at Davis-Monthan AFB in 2003, the 563rd RQG has worked diligently with the 355th FW do, in part, to their closely related operations. 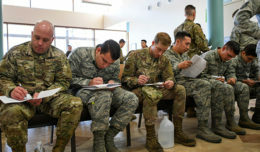 As a result of their previous and ongoing working relationship, the 355th FW and 563rd RQG realignment will have very little affect on missions here. 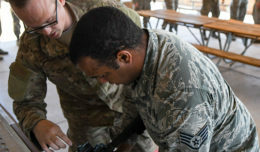 With this realignment, the 355th FW has increased its capabilities by integrating with a team that possesses a like mission set and can now provide greater support to troops downrange.